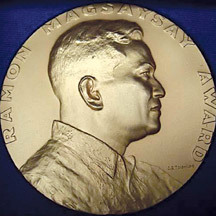 The latest Ramon Magsaysay Awards will be presented to six outstanding Asians on August 31, 2012 at a high level awards ceremony in Manila, The Philippines. The prestigious Ramon Magsaysay Award, considered Asia's Nobel Prize, is an annual award that honours 'greatness of spirit and transformative leadership in Asia'. Administered by the Ramon Magsaysay Award Foundation, the award is given to persons -- regardless of race, nationality, creed or gender -- who address "issues of human development in Asia with courage and creativity, and in doing so have made contributions which have transformed their societies for the better." The award was set up in 1957 in honour of the former Philippine President Ramon Magsaysay and to promote his legacy of integrity in government, courageous service to the people, and pragmatic idealism within a democratic society. It is given in six categories, viz: government service; public service; community leadership; journalism, literature and creative communication arts; peace and international understanding; and emergent leadership. Today's Wiz Quiz salutes past awardees, with particular focus on Sri Lanka. 1. 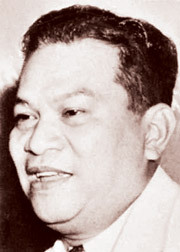 The first Ramon Magsaysay Awards were given on August 31 , 1958 to five outstanding individuals working in India, Indonesia, Philippines, Republic of China (Taiwan) and Sri Lanka, and a Philippine-based organization. The winner from Sri Lanka was born in Ontario, Canada, in 1873, qualified as a medical doctor and came to Ceylon in 1896, initially to join the American Medical Mission at Jaffna. In 1898, she moved to Colombo, married a Ceylonese and started her private practice. Although she was a highly popular medical practitioner, she is better remembered for her social welfare and charity work. In 1930, she co-founded the Lanka Mahila Samiti that enabled a silent revolution in social and economic empowerment of Lankan women. In recognition of her decades of selfless work, she was honoured with the first Ramon Magsaysay Award for Public Service. Who was she? 2. Up to the end of 2011 (not counting 2012 winners), the Magsaysay Award had recognized a total of 272 individuals and 18 organizational recipients. India has produced the highest number of awardees, 48. Among the first awardees in 1958 was an Indian advocate of nonviolence and human rights, best known for starting the Bhoodan Andolan, a voluntary land reform movement in India. 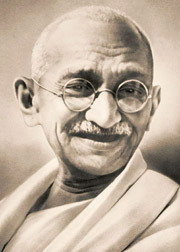 Some considered him to be a spiritual successor of Mahatma Gandhi. Who was this remarkable man? 3. During the past half century, nine Lankans have been honoured by Ramon Magsaysay Awards. Five of them have been recognized in the category for journalism, literature and creative communication arts. The first Lankan to be honoured in this category, in 1959, was a renowned journalist and editor. The citation noted how he, as then editor of Ceylon Observer, "called to public attention abuses in government and supported those who deserved the public trust." He was also hailed for his book, Emergency '58, for giving "a vivid documentary of the 1958 communal riots in Ceylon." Who was this journalist, who went on to the global arena and blazed many new trails? 4. In 1969, on the centenary of Mahatma Gandhi's birth, the Ramon Magsaysay Award for Community Leadership was given to Ahangamage Tudor (A T) Ariyaratne, founder and leader of Sarvodaya Shramadana Movement . Sarvodaya was only a decade old at the time, but the award's trustees recognized how it had already become the largest national voluntary movement in Sri Lanka and was a major player in human development. To which remote and resource-deprived village in the Kurunegala District did 75 teachers and students of Nalanda College Colombo go under school teacher Ariyaratne's leadership to carry out the first shrama-dana or donation of labour in 1958, which led to Sarvodaya's origins? 5. The Magsaysay Award for Public Service was presented in 1976 to a French Missionary of the Lasallian Brotherhood who had worked quietly and selflessly to enhance life skills of underprivileged children in Sri Lanka. In 1963, while serving as the Principal of De Mazenod College, Kandana, he founded Diyagala Boys' Town in Ragama. It has now evolved into a self-sustained community of around 200 male children from marginalized families who spend four years of residential life in non-formal education and vocational training. This founder was recognized for "his effective teaching of skills, values and discipline that build underprivileged and delinquent boys into self-respecting, useful citizens." Who was he? 6. In 1979, the Ramon Magsaysay Award for journalism, literature and creative communication arts was presented to an outstanding Lankan artist and painter, recognizing "his preserving for the people of Sri Lanka and the world the 2,000-year-old tradition of classical art found in their great Buddhist temples." The award citation noted how this person had been visiting hundreds of temples since 1950, sometimes living on wild fruits from the jungle, and "systematically documented, and copied or traced, thousands of neglected and fast disappearing mural paintings." Who was this artist? 7. The Magsaysay Award for journalism, literature and creative communication arts was presented in 1983 to Lankan Catholic priest, musician, lyricist, author and poet Fr Marcelline Jayakody (1902 - 1998). The citation noted how "this silver-haired, singing priest, who stands tall and cheerfully exudes his faith, has helped through music and song to bring to every Sri Lankan an awareness of his heritage." In all, he wrote the lyrics and music for over 1,000 Sinhala songs -- from lullabies and Christmas carols to patriotic songs. Three years before this award, he became the first Catholic priest to win Sri Lanka's State Literary Award for his book of Sinhala poetry published in 1979. What was the award-winning book's title? 8. 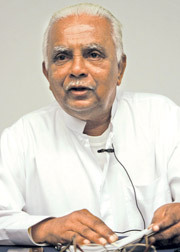 The 1988 Magsaysay Award for journalism, literature and creative communication arts was presented to a colossus in Sri Lanka's arts and culture, who was described in the award citation as "Sri Lanka's premier playwright...and also a prolific literary critic who has set new standards for Sinhalese writing." It also noted how his novels and short stories offered "trenchant commentary on contemporary life." The award trustees recognized "his creating modern theater from traditional Sinhalese folk dramas and awakening Sri Lankans to their rich cultural and spiritual heritage." Who was this university professor and social critic? 9. The 2001 Magsaysay Award for journalism, literature and creative communication arts was presented to Pandit W D Amaradeva, musician and vocalist, in recognition of "his life of dazzling creativity in expression of the rich heritage and protean vitality of Sri Lankan music." The award citation called him "a prodigious creative artist" who has composed music for ballet, film, the stage and countless radio and television programmes. He has written over 1,000 songs (up to that time) - "melodious, lyrical, haunting songs of patriotism, beauty, faith, passion and love". 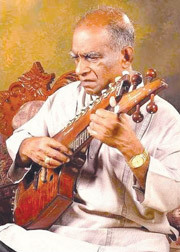 He was also recognized for his innovation - creating a uniquely Sri Lankan synthesis using an entire spectrum of borrowed and indigenous influences. The name Amaradeva ('immortal god') was given to him by close associate Dr Ediriweera Sarachchandra in 1958. What was his versatile artiste's birth name? 10. The most recent Lankan to win the Ramon Magsaysay Award, and the only one to do so in the category of emergent leadership, is a young psychologist and co-founder of the Mangrove, a network of organisations and individuals in Batticaloa dedicated to coordinating psychosocial aspects of the relief effort. He was recognized in 2008 for "his spirited personal commitment to bring appropriate and effective psychosocial services to survivors of war and natural disaster in Sri Lanka". Who is he? 11. The first newspaper in Ceylon, besides the government Gazette, was Colombo Journal, started in 1832. It had the encouragement of the colonial government, and the then Governor contributed articles to this newspaper under pen-names like Timon and Pro Bono Publico. The newspaper was closed down the next year on the orders from London -- probably because it had been too critical of the bureaucracy in England. Who was the British Governor involved? 12. Successful authors often receive manuscripts from unpublished writers, asking for their criticism. Who once advised one young man: "Your work is both good and original. But the part that is good is not original. And the part that is original is not good." 13. Which noted American writer of science fiction once remarked: "The supreme irony of life is that hardly anyone gets out of it alive"? 14. Diego Garcia is located south of the equator in the Indian Ocean, some 500 km south of the Maldives. It is part of the British Indian Ocean Territory, but has been leased out to the United States (US) Navy since 1971 to operate a large naval base, military air base, communications and space tracking facilities. Diego Garcia is the largest island in an archipelago comprising around 60 small islands grouped into seven atolls. What name is given to this archipelago? 15. Soyuz is the collective name given to a series of spacecraft, initially designed for the Soviet Space Programme in the mid 1960s, and still in use - making it the most frequently used and most reliable Russian launch vehicle to date. Soyuz is also the name of rockets launching spacecraft into orbit. What does the Russian name 'Soyuz' literally mean?